Double G&J Ranch: Here He is! Here's the promised picture of our new nephew, Elijah Charles Erickson. 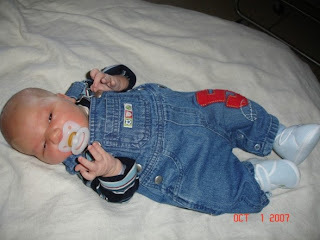 He was big enough to wear a pair of adorable overalls home from the hospital! Very cute pictures...just catching up on my blogs! Hope all is well with you! Our Bundle of JOY is here!